Why buy at an expensive coffee shop? 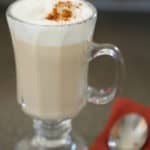 Make it at Home - London Fog Recipe which is just like the store-bought kind. Featuring earl grey tea, syrup and steamed milk - delicious! Place Earl Grey tea bag in a coffee mug of boiled water, leaving room for milk. Remove tea bag when steeped. Pour frothed milk into cup and enjoy!